Ready to drop off your recyclables? We’ve got some tips to keep everything going smoothly. ABC’s next Plastics Round-Up is Saturday April 6th from 10am – 2pm! #2, #4, and #5 tubs, jugs, bottles, lids, and beverage handles. 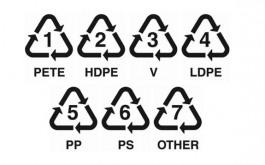 Your containers should have this number clearly marked on them! Items should also be clean and dry and free of labels. How Do I Get This Label Off? A good soaking will take off most adhesive labels. For really sticky stuff, some old cooking oil can be applied and left to sit overnight. Wiping it clean in the morning should be no problem. What’s the Difference Between a Bottle, Jug, and a Tub? Bottles and jugs have threaded lids, and you can usually see where the bottleneck was attached (welded) to the main container. There will be a seam in the plastic. Tubs, on the other hand, usually have snap-on lids, and the container is in one piece. 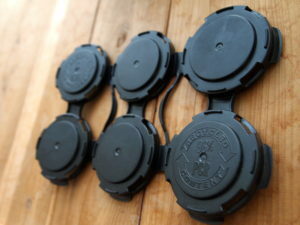 These hold your six packs together and can be recycled, unlike traditional six-pack holders. They’re also called PakTech holders. Look for the PCR label. We actually have a couple local breweries with drop-off points for these at all times, including Claim 52 on Willamette. So you don’t have to save them for the round-up if you don’t want to.